Learn More About Our Industry! Learn More by Visiting these Industry Links! A business can often be known by the company it keeps. We're proud to be associated with one of the industry's top metal building fabricators, and with local and national organizations that promote the kind of work we do... and that help set the standards we continually strive for. 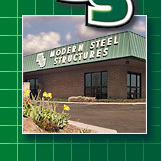 If you have any questions about these organizations, or the metal building industry in general  or how Modern Steel Structures can help your company's needs  please let us know!